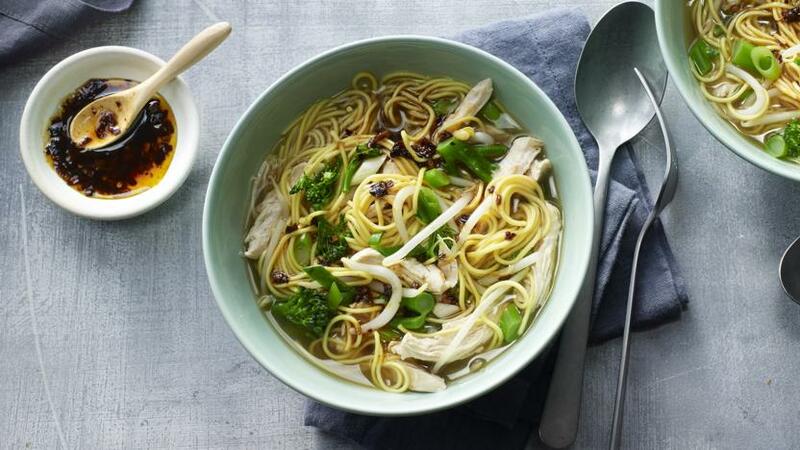 A great noodle soup recipe for using up leftover cooked chicken breast and either broccoli, peas or any other vegetables that need eating. Good stock is the key to this recipe, so use the best you can get your hands on. Pour the chicken stock into a pan and add 200ml/7fl oz water. Add the garlic and ginger to the stock and set the pan over a very low heat for 5 minutes to gently simmer and to allow the garlic and ginger to infuse. Using a slotted spoon, remove the garlic and ginger from the pan and discard. Shred the chicken breast into small, bite-sized pieces and add to the stock with the egg noodles. Simmer the broth for 2–3 minutes, or until the noodles are tender and the chicken is hot. If using, cut the broccoli into 5mm/¼in pieces and thinly slice the spring onions. Add to the pan (or add peas if using instead of broccoli) with the soy sauce and simmer for a further minute. Add the beansprouts to the soup and warm through for 30 seconds. Divide among two deep bowls and serve with a drizzle of chilli or sesame oil, if you like.